Product Description: From World War II through the muscle-car era, Chrysler s innovation and experimentation took center stage, quite literally, in the form of its concept cars. These concept cars hinted at future production vehicles and explored new and unproven technologies. 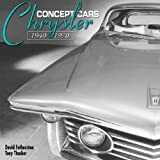 Chrysler Concept Cars 1940-1970 follows the design, development, and creation of almost 50 Dodge, Chrysler, and Plymouth concept cars during the automotive industry's golden postwar years, when Chrysler set the Detroit style. Readers get an inside look not only at the styling of the cars, but also at performance developments and engineers unique ideas. The book delivers many never-before-published vintage black-and-white and color photos located during hundreds of hours of research in the Chrysler Historical Archives, the Henry Ford Museum, the Detroit Public Library, and other private collections. While writing this book, veteran automotive writers David Fetherston and Tony Thacker enlisted the help of more than 10 Chrysler designers, engineers, technicians, and librarians over three years. The book is the definitive edition on this subject, as a book with such detail specializing in this period of Chrysler s history has never been produced.